Today I thought I'd shock the hell out of your upcoming weekend, by sharing photographs of before and after transformations of NYC drag queen performers. 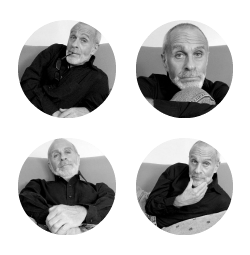 And please don't ask me how or why I found these photographs while Googling, "men who wear lip balm", but when I did, I just knew I had to share them with you. 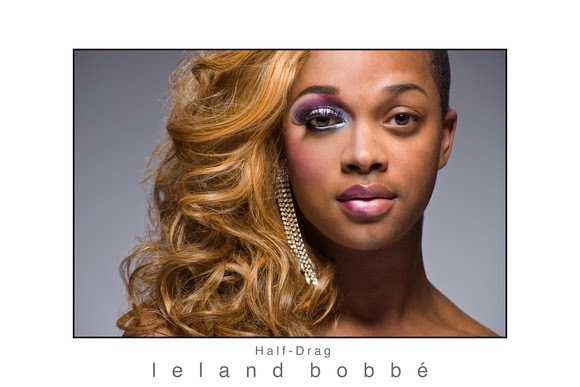 Leland Bobbe, a New York-based photographer, put together a series of portraits that examine the idea of gender fluidity by showing New York City drag queens in half-drag. 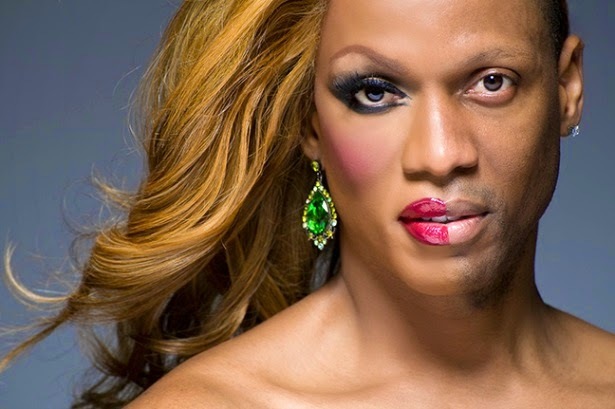 The series is called “Half-Drag … A Different Kind of Beauty." And I suppose, having been a stage actor myself, I found these photographs utterly fascinating because of what some performers go through to transform themselves into a character using costumes, hair, and makeup. 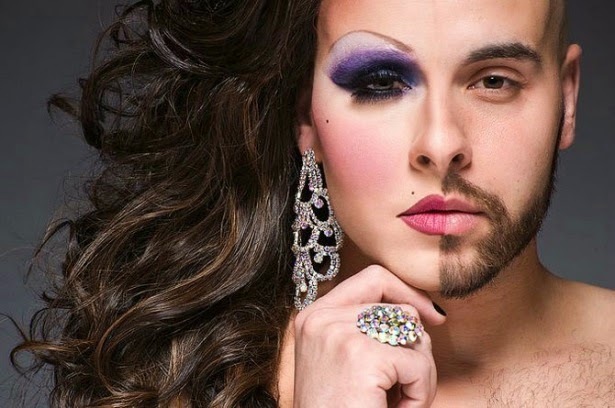 *note: To get a really good idea of how amazing these transformations are, place one of your hands or a piece of paper on one side of each face, and then go back and forth from side to side to see the contrasts between male/female. First comment? Say what?!? Anyways I love number 4! Before his transformation you would never guess he likes to do drag and that is something I love! Showing that anyone can enjoy performing this way and there are so many stereotypes about it to break! Great post and amazing photos! Ron, these are incredible! The transformation in #4 is amazing because the difference in each half is mind blowing. He looks like two completely different genders. I also love #6. And as a woman, I'm jealous of their makeup ability Lol. My girlfriends and I have gone to a drag club in Fort Lauderdale several times and we always have so much fun. Yes, isn't #4 AMAZING? When you look at each half separately, it's unbelievable! "Showing that anyone can enjoy performing this way and there are so many stereotypes about it to break!" "The transformation in #4 is amazing because the difference in each half is mind blowing. 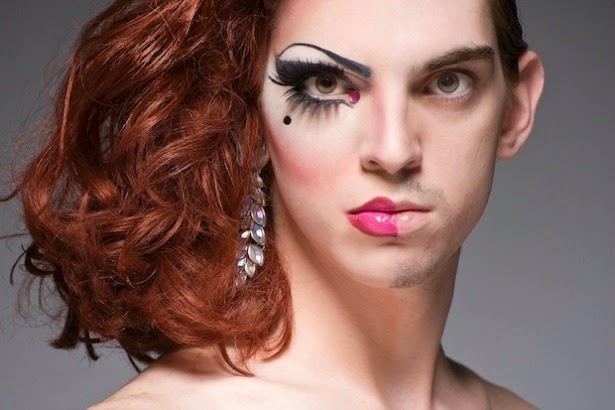 He looks like two completely different genders." I agree! I think #4 is the most amazing! I love #6 too. GREAT makeup contour! "My girlfriends and I have gone to a drag club in Fort Lauderdale several times and we always have so much fun." There used to be a few I went to in Lauderdale and Miami when I still lived in Florida, where they did impersonations of celebrities and they were faaaaabulous! Thanks so much for stopping by, girl. Have a wonderful week!! Ron, I did what you suggested and placed my hand on one side of each face comparing the two....WOW! #4, to me, is the most impressive. Are you SURE they're men made up to look like women? Of course you are, but honestly they look fabulous. Those with high cheekbones are less convincing than the ones with more rounded cheeks but they all still look fab. The very first pic is soooo convincing. Have a superb weekend and I hope the weather is good. Oh, yes, got to tell you that Joe had the all clear yesterday. Now, isn't THAT good news. I'll blog it later. "And please don't ask me how I found these photos..." Bahahahaha....oh, that cracked me up good! I think the top photo under your title is the best one.......would completely think that's a woman, and a beautiful one at that. But I also think number 2 is very believable as well. Fun post! Hope you aren't in a blizzard like we are right now! I've seen this series of photos before and they are amazing. I do enjoy drag shows - such great fun. That really is remarkable. It's always been interesting to me that men in drag generally look like caricatures of women. Notice how they draw their lipstick outside their actual liips to exaggerate the shape? And the eyes of course. The first one below the title and #2 already have soft, round faces and chins, so they look very feminine even not in drag. The rest are very well done but where they were sweet-looking as men, they are kind of threatening looking as women. Beautiful, but not approachable. Ron, the thing that stands out to me here is that these portraits depict MUCH better-looking female sides than male sides. Wonder why?? Perhaps it just goes to show how much we ladies are able to camouflage, thanks to makeup, jewelry, and lots of hair, ha! I think most of these men are very good looking, even without the make up, so most of them could certainly use less makeup & still make a very good looking woman. I understand the makeup is probably for the stage & so needs to be a little more over the top. All of these pictures show good looking people regardless of their gender. This is certainly a great concept for pics! Fascinating post, Ron! One thing I can say about your blog is that it's never a drag! Seriously, though, this is an intriguing look at another lifestyle,. Great job, buddy! #4 is one of my personal favorites because it's such HUGE comparison, especially with him having the beard on one side!
" At least, these pic prove there is power in make up...I just need a thicker coat and brighter colors next time, ha!" Bwhhahahahahahaha! That CRACKED ME UP!!!!! Thanks so much for stopping by, Suzi! Have a fantabulous weekend! "Are you SURE they're men made up to look like women?" HAHAHAHAHA! Great question, Valerie! They could actually be women in MEN'S drag! "Those with high cheekbones are less convincing than the ones with more rounded cheeks but they all still look fab." "Oh, yes, got to tell you that Joe had the all clear yesterday. Now, isn't THAT good news. I'll blog it later." Yahooooooooooo! Oh, what GREAT news!!!!!! And I bet you and Joe are SO relieved and HAPPY! Please tell Joe I said, CONGRATULATIONS!!!! Have a super weekend, dear lady. MUCH X to you and Joe!!!!! Yes! Can you believe I found these photographs Googling "men who wear lip balm!?!?!" I agree, the first photo under the post title is VERY convincing!! And #2 as well! Thanks so much for stopping by, friend! Have a faaaaabulous weekend! P.S. You're in a BLIZZARD?!? WOW! We got a tiny bit of snow last night, but not much. However, it's FREEZING cold. But you know me, I love it!
" 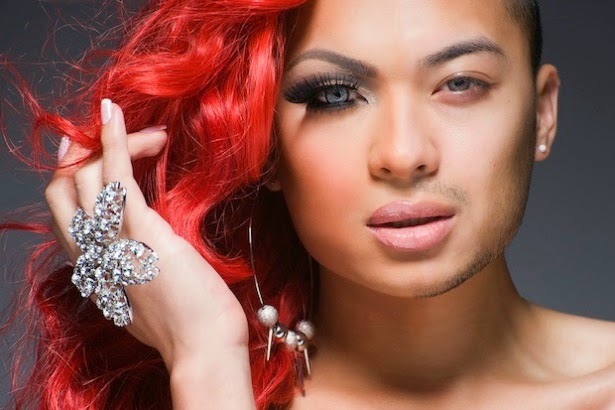 It's always been interesting to me that men in drag generally look like caricatures of women. Notice how they draw their lipstick outside their actual liips to exaggerate the shape? And the eyes of course." Yes, you're right, they do. And I think that's because of being onstage and having to exaggerate the features so that they "read" from a distance. "The first one below the title and #2 already have soft, round faces and chins, so they look very feminine even not in drag." I agree, some of them already have very soft features (even as men) so they look somewhat feminine even not in drag. Yet, some of the other ones close-up would be over-the-top. "One thing I can say about your blog is that it's never a drag! " Bwhahahahahaha! Rob, you crack me up with your clever wit! That was GREAT! "Seriously, though, this is an intriguing look at another lifestyle." Yes, isn't fascinating to see another lifestyle? Have a SUPA' weekend, buddy, and thanks so much for stopping by!
" I understand the makeup is probably for the stage & so needs to be a little more over the top." Yes, absolutely, it is for stage so it needs to be exaggerated and over the top. But I agree, these men are even good-looking without the makeup. 'All of these pictures show good looking people regardless of their gender. This is certainly a great concept for pics!" I agree, and I think that's what the photographer was trying to say with this - beauty regardless of their gender. Thanks so much for stopping by, my friend. Hope you're feeling better and have a grrrrrreat weekend! Ron, I don't how you come up with these posts every week and keep them all very interesting. These portraits are amazing! And it's interesting to me that he examined the idea of gender fluidity and how we all have male and female in us. Two halves completing a whole. #'s 2 and 4 are my favorites. But I really like the makeup in #6. "And it's interesting to me that he examined the idea of gender fluidity and how we all have male and female in us. Two halves completing a whole." Yes, and I think that's exactly what he was trying to convey with these portraits, the male and female within all of us.
" But I really like the makeup in #6." Thanks so much for stopping by, buddy. Have a terrific weekend! 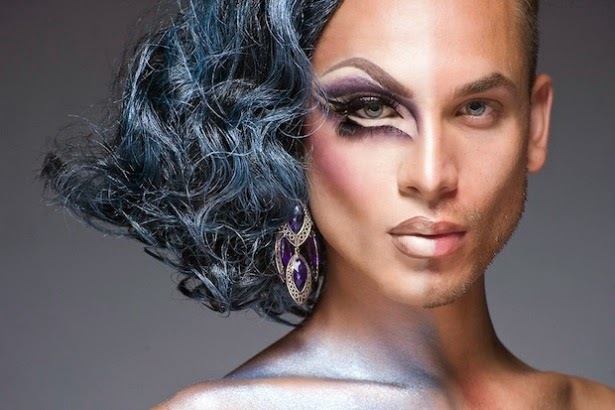 Boy, these pics really make you appreciate the transformative power of makeup. I only wish there were profile shots from each side, as well - I'd love to see how convincing both halves look. Hope your weekend is a full and fun one, Ron! Ron, this post was fascinating. I also showed the portraits to my husband and he said WOW! Great transformations. #6 is beautiful.
" I only wish there were profile shots from each side, as well - I'd love to see how convincing both halves look." Yes, I would too, Mark! That would be SO cool!
" I also showed the portraits to my husband and he said WOW!" Aren't these transformation portraits GREAT? And I agree, #6 is beautiful. Amazing makeup! This was really interesting Ron, it is amazing how similar but yet how different they looked before and after, #3 looked kind of scary to me, not sure I'd want to see this one, the rest were pretty cool.
" #3 looked kind of scary to me, not sure I'd want to see this one...."
HAHAHAHA! I know what you mean, I think it's the EYES in that one. Thanks a bunch for stopping by, buddy. Have a grrrrreat weekend! They have such skills with their makeup and they all look so beautiful. Absolutely amazing, Ron! I've watched RuPaul's Drag Race with my niece who watches Logo all of the time. After watching a few episodes, I can so appreciate the hard work that goes into these transformations. I just about have the patience to wear some shadow and mascara; yet, these make overs are like works of art. Oops. I clicked too fast? Babs, isn't #6 faaaaaabulous? When I held my hand over one side of his face and then flipped it from side to side, I was amazed by how completely different they were. AMAZING! "They have such skills with their makeup and they all look so beautiful." I agree, these are all awesome makeups, aren't they? Like an ART. "I've watched RuPaul's Drag Race with my niece who watches Logo all of the time. After watching a few episodes, I can so appreciate the hard work that goes into these transformations." I LOVE RuPaul's Drag Race! And talk about an amazing transformation! He looks so completely different IN and OUT of drag. I also think he's a wonderful interviewee because I love to hear him talk about his life and beliefs. VERY interesting man. Thanks so much for stopping by, dear friend. Have a great rest of your weekend! There are a couple of these gals that I wouldn't wanna meet in a dark alley. LOL. I have to say, the second one was just cute.....and the top one, amazing. The rest, holy heck--talk about makeup overkill. But the point is made, there's a fine line....genetics are a strange thing. And we have snow! I finished up clearing the patio off just in time to make a snowman!! Woohoo! "There are a couple of these gals that I wouldn't wanna meet in a dark alley. LOL"
HAHAHAHAHAHA! Mel, that CRACKED ME UP! Yeah...there are a few here that are tad over the top. But it's as you said, the point is made. It's all about genetics. OMG...you have SNOW?!?! I am soooooo jealous! We got a tiny, tiny bit a few nights ago, but it didn't land because it was mixed with rain. I can't wait to make a SNOW ANGEL!!!!! Ron, I visited Ieland Bobbe's portfolio on his website and it was awesome! He takes such a variety of photographs. Aren't they great, Robert? And so completely different from the one's shown here! I tried covering one side at a time and you are right. To get made up like that must be a ton of work! "I tried covering one side at a time and you are right." Aren't the transformations, amazing, Pat? And yes, I sure it must take a TON of work. This post is INCREDIBLE. I was so fascinated by it that I went over it a few times... putting my hand over one side of each face and then the other. Just amazing! Isn't it amazing?!?! It's like looking at two different people within the same person. Thanks a bunch for stopping by, Katherine!